FRACTRACKER ALLIANCE: Who Lives Near the Refineries? Who Lives Near the Refineries? Communities living along the North Coast of the East Bay region in California are the most impacted by the presence of the petrochemical industry in their communities. Emissions from these facilities disproportionately degrade air quality in this corridor region putting residents at an elevated risk of cancer and other health impacts. People of color are more likely to live near the refineries and are therefore disproportionately affected. The North Coast of California’s East Bay region hosts a variety of heavy industries, including petroleum refineries, multiple power plants and stations, chemical manufacturing plants, and hazardous waste treatment and disposal facilities. Nationwide, the majority of petroleum refineries are located in heavily industrialized areas or near crude oil sources. The north coast region is unique. Access to shipping channels and the location being central to the raw crude product from North Dakota and Canada to the North, and California’s central valley oil fields to the south has resulted in the development of a concentrated petrochemical infrastructure within the largely residential Bay Area. The region’s petrochemical development includes seven fossil fuel utility power stations that produce a total of 4,283 MW, five major oil refineries operated by Chevron, Phillips 66, Shell Martinez, Tesoro, and Valero, and 4 major chemical manufacturers operated by Shell, General Chemical, DOW, and Hasa Inc. This unequal presence has earned the region the title, “refinery corridor” as well as “sacrifice zone” as described by the Bay Area Refinery Corridor Coalition. The hazardous emissions from refineries and other industrial sites are known to degrade local air quality. It is therefore important to identify and characterize the communities that are affected, as well as identify where sensitive populations are located. The communities living near these facilities are therefore at an elevated risk of exposure to a variety of chemical emissions. In this particular North Coast region, the high density of these industrial point sources of air pollution drives the risk of resultant health impacts. According to the U.S.EPA, people of color are twice as likely to live near refineries throughout the U.S. This analysis by FracTracker will consider the community demographics and other sensitive receptors near refineries along the north coast corridor. In the map below (Figure 1) U.S. EPA risk data in CalEnviroscreen is mapped for the region of concern. The map shows the risk resulting specifically from industrial point sources. Risk along the North Coast is elevated significantly. Risk factors calculated for the region show that these communities are elevated above the average. The locations of industrial sites are also mapped, with specific focus on the boundaries or fencelines of petrochemical sites. Additional hazardous sites that represent the industrial footprint in the region have been added to the map including sites registered with Toxic Release Inventory (TRI) permits as well as Superfund and other Comprehensive Environmental Response, Compensation, and Liability Act (CERCLA) sites. The Toxmap TRI sites are facilities that require a permit to emit hazardous air pollutants. The superfund and other CERCLA sites are locations where a historical footprint of industry has resulted in contamination. The sites are typically abandoned or uncontrolled hazardous waste sites that are part of register for tax-funded clean-ups. 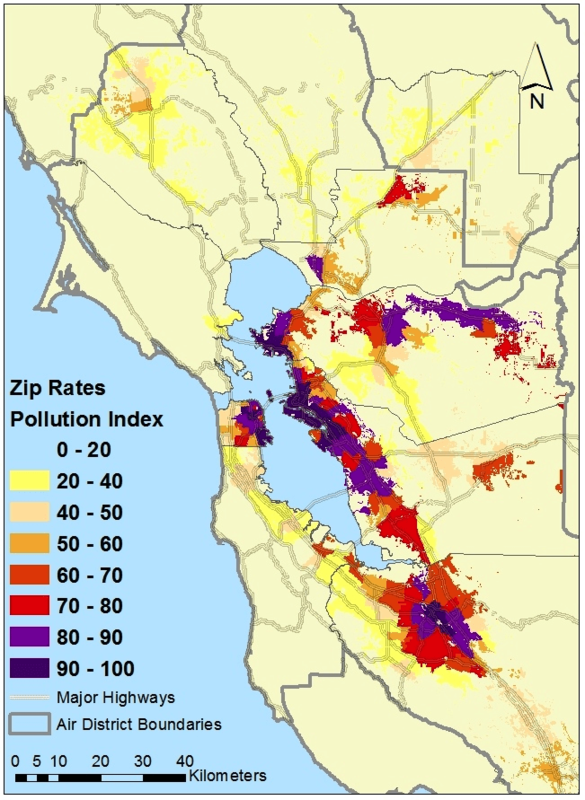 Disparate health impacts are therefore a known burden for these Bay Area communities. The region includes the cities of Richmond, Pinole, Hercules, Rodeo, Crockett, Port Costa, Benicia, Martinez, Mt. View, Pacheco, Vine Hill, Clyde, Concord, Bay Point, Antioch, and Oakley. In addition to preserving the ecological system health of this intercostal region is also important for both the ecological biodiversity of the marsh as well as commercial and recreational purposes. These wetlands provide a buffer, able to absorb rising waters and abate flooding. The Bay Area Air Quality Management District’s (BAAQMD) Cumulative Impacts report identified areas where air pollution’s health impacts are relatively high in the San Francisco Bay Area. The report is does not limit their analysis to the North Coast, but shows that these regions with the most impacts are also the most vulnerable due to income, education level, and race and ethnicity. The report shows that there is a clear correlation between socio-economic disadvantages and racial minorities and the impacted communities. Figure 3 shows the regions identified by the BAAQMD as having the highest pollution indices. This analysis by FracTracker focuses specifically on the north shore of the East Bay region. Like the BAAQMD report, National Air toxic Assessment (NATA) data to identify census tracts with elevated risk. Specifically, elevated cancer and non-cancer risk from point sources emitting hazardous air pollutants (HAPs) as regulated by the U.S. EPA were used. CalEnviroScreen 2.0 data layers were also incorporated, specifically the U.S. EPA’s Risk Screening Environmental Indicators (RSEI) data. RSEI uses toxic release inventory (TRI) data, emission locations and weather to model how chemicals spread in the air (in 810m-square grid units), and combines air concentrations with toxicity factors. The census tracts that were identified as disproportionately impacted by air quality are shown in the map below (Figure 4). The demographics data for these census tracts are presented in the tables below. Demographics were taken from the U.S. census bureau’s 2010 Census Summary File 1 Demographic Profile (DP1). The census tracts shapefiles were downloaded from here. Buffers were created at 1,000 ft; 2,000 ft; and 3,000 ft buffers from petrochemical sites. These distances were developed as part of a hazard screening protocol by researchers at the California Air Resources Board (ARB) to assess environmental justice impacts. The distances are based on environmental justice literature, ARB land use guidelines, and state data on environmental disamenities (Sadd et al. 2011). A demographical profile was summarized for the population living within a distance of 3,000 feet, and for the census tracts identified as impacted by local point sources in this region. The analysis is summarized in Table 1 below. Additional data on the socioeconomic status of the census tracts is found in Table 2. Table 1. Demographic Summaries of Race. Data within the 3,000 ft buffer of petrochemical sites was aggregated at the census block level. The results of the refinery corridor analysis show that the communities living along the North Coast of the East Bay region are the most impacted by the presence of the petrochemical industry in their communities. Emissions from these facilities disproportionately degrade air quality in this corridor region putting residents at an elevated risk of cancer and other health impacts. The communities in this region are a mix of urban and single family homes with residential land zoning bordering directly on heavy industry zoning and land use. The concentration of industry in this regions places an unfair burden on these communities. While all of California benefits from the use of fossil fuels for transportation and hydrocarbon products such as plastics, the residents in this region bear the burden of elevated cancer and non-cancer health impacts. Additionally, the community profile is such that residents have a slightly elevated sensitivity when compared to the rest of the state. The proportion of the population that is made up of more sensitive receptors is slightly increased. The region has suburban population densities and more children under the age of 5 than average. The number of people of color living in these communities is elevated compared to background (all of California). The largest disparity is for Black or African American residents. There are also a large number of schools located within 3,000 ft of at least one petrochemical site, where over half the students are Hispanic and the vast majority are students of color. Overall, people of color are disproportionately affected by the presence of the petrochemical industry in this region. Continued operation and any increases in production of the refineries in the East Bay disproportionately impact the disadvantaged and disenfranchised. With this information, FracTracker will be elaborating on the work within these communities with additional analyses. Future work includes a more in depth look at emissions and drivers of risk on the region, mapping crude by rail terminals, and working with the community to investigate specific health endpoints. Check back soon. Sadd et al. 2011. Playing It Safe: Assessing Cumulative Impact and Social Vulnerability through an Environmental Justice Screening Method in the South Coast Air Basin, California. International Journal of Environmental Research and Public Health. 2011;8(5):1441-1459. doi:10.3390/ijerph8051441.